The current issue of ascent marks the end of our long-running cartoon column depicting the lessons of the Gita. Over the past two years, NY-based cartoonist R. Sikoryak has been drawing out the lessons of yoga by combining a parody of Charles M Schulz' Peanuts comic strip with the actual text from a spiritual classic, the Bhagavad Gita. Sikoryak has long been known for his technique of mixing great literature and religious texts with satires of familiar North American comic characters such as Dilbert, Batman, and Spider-Man. 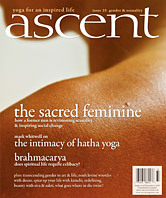 It's been an honour to feature his work regularly in the pages of ascent. In this exclusive interview, Sikoryak tells us about his journey through the Gita and how the series came together. Luna Allison: I understand that you didn't have any knowledge about the Bhagavad Gita before you started this cartoon series for ascent magazine – where did your interest in doing the series spring from? Robert Sikoryak: When ascent asked me to adapt the Bhagavad Gita, it was a perfect opportunity for me to dig deeply into a text I’d heard about in yoga classes but never read. Using parodies of the Peanuts characters seemed like an appropriate mix – what better way to explore a deeply profound text than through the style of America’s greatest comic strip? RS: For the past 20 years, I’ve been adapting classic books and plays into comic strips, and I always draw them as parodies of famous cartoons. For instance, I did an adaptation of Crime and Punishment in the style of Batman comics, and a version of Dante’s Inferno that resembles Bazooka Joe bubblegum strips. The combinations highlight parallels in the storylines, and emphasize the poignancy and humor in the original cartoons. I’m interested in great literature and great cartoons, and I enjoy seeing what happens when they collide. LA: Do you have a special connection to the Peanuts strip? RS: I grew up reading Peanuts, and it’s one of the strips that made me want to be a cartoonist. It's simply drawn but deeply felt—Charlie Brown and all of the characters struggle in their daily lives and are looking for comfort. Also, Charles Schulz famously incorporated quotes from the Bible into his stories. So, seeing how his characters might respond to other religious philosophy was an amusing, and hopefully enlightening, idea. LA: What would you say is the most valuable thing you've learned from your experience of drawing the Gita over the past two years? RS: Drawing the Gita has been a special challenge. Boiling down the original text to fit the space and style of a comic strip required a very close reading (and many re-readings). By necessity, its concepts and philosophy echoed loudly in my head the whole time. Trying to evoke the feeling of the Peanuts strip while searching for parallels to the Gita has been a great practice and a real pleasure. LA: Has this project affected other areas of your life? RS: Luckily, the Bhagavad Gita is a beneficial text to have stuck in your brain – certain ideas can be quite encouraging, no matter what your job. The Gita is so multifaceted, I'm reluctant to reduce it to a sound byte here, but suffice it to say there’s plenty of inspiration to be gotten from it, whether you’re engaging in mortal combat or drawing little pictures in boxes. LA: How has the process of drawing this series influenced your yoga practice? RS: I can’t say it’s made me more interested in yoga—I’ve been attending classes regularly for years— but it has certainly informed my practice. One idea that's particularly resonated with me is that it's better to do your own duty badly, than to do another's perfectly. It's worth remembering as I'm falling out of a yoga pose.